Staff at Abertay University in Dundee believe they have spotted some Banksy graffiti art in their car park. 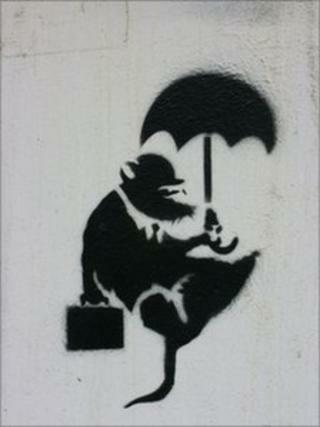 The work features a common Banksy image of a rat in a suit - but this time holding an umbrella and falling. It is thought this could be a tribute to one of the "floater" characters in the computer game Lemmings, which was created by former student Dave Jones. The 20th anniversary of the game's release was celebrated recently at the university. A member of staff who has seen the graffiti said: "This image seems to have sprung up in the last day or two, so may well be Banksy's own tribute to Lemmings and the Dundee computer games industry." He admitted it was possible the work was a "copycat image", but said many other Banksy imitations did not have the same sharp edges and high detail that this work did. The anonymous street artist never confirms or denies his graffiti. Dundee's links to the gaming industry are often said to have begun with the Lemmings. The hugely popular computer game was written by Mr Jones for Commodore Amiga and released in 1991. The game involved guiding lemmings around obstacles to an exit and hooked millions of people. He went on to develop Grand Theft Auto, cementing his reputation as one of the most respected games developers in the industry. Recognising the success of both these games, Abertay became the first university in the world to offer a course in software engineering for video games in 1996. Mr Jones' last company, Realtime Worlds, went into administration in 2010.